Budget Wedding Flowers That Won’t Break The Bank! From High Street wedding dresses to cost effective cakes we’ve shared our thoughts on how to save money on your wedding day in a number of ways. This week, we’re looking at how to make savings on your wedding flowers. A leading London florist has recommended couples assume at least 10% of their overall budget needs to be allocated to their wedding flowers. With the average wedding now costing around £30,000 that’s an awful lot of money to spend on something that will last little longer than a week! So what can you do? The Woodhall Manor wedding planners have a few suggestions for you. We love the range of wedding flowers offered by High Street hero Marks & Spencer. For a straightforward click and collect option you can’t go far wrong with this range of bouquets, buttonholes and arrangements. With a selection of popular colour schemes to choose from, all the classics are covered such as white, pink, ivory, lilac and yellow. 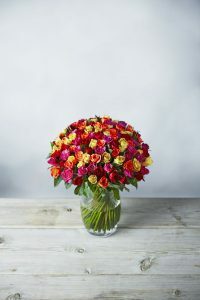 The range includes roses, orchids, lilies and freesias that have been handily grouped into packages allowing you to order everything you need at a reasonable price. A bride’s bouquet, 2 bridesmaids posies, 4 buttonholes, 2 table arrangements and a vase arrangement of luxury creamy white roses is available for £275, which we think offers really good value when compared to many traditional florists. 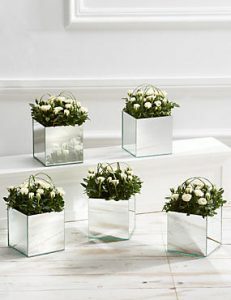 For statement table centrepieces the Pure Rose Mirrored Cube arrangements which are £150 for 5 would be perfect. If your reception is a more rustic affair, the Celebration Table Plan in Ivory at £70 includes a crate of roses for the top table, as well as 5 plant pots of roses for guest tables. These come complete with charming wooden plant markers so you can handwrite guest names and if you need more, sets of 5 plant pots of roses can be ordered separately. Whilst the range from Waitrose is noticeably smaller than M&S, there are still some options here to source your wedding flowers cost effectively. With bouquets starting at just £25, these can be easily arranged in jugs and vases at your reception venue to create a gorgeous floral scheme. 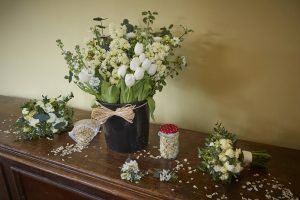 Why not hand tie one of these glorious bouquets and use as your bride’s or bridesmaid’s flowers? There are some nice accent arrangements available such as garden planters and potted rose trees that would look stunning in a barn or marquee setting for a classic English country wedding. If you’re ready to really get stuck in with your floral creations, then we think the ready-to-arrange bouquet of 100 sweetheart roses at just £48 is perfect and could easily create two or three posies for the bride and her attendants. This website is really geared up to help couples see exactly what options exist depending on the time of year that you’ve chosen to get married. It’s a bit like a pick and mix where you choose which elements you need, and then place an order for the exact number of buttonholes or posies that you require. As well as the traditional floral options, there are also some really nice ideas such as floral wands for flower girls, and even a floral crown for the bride. There are also lots of packages to choose between so that you can quickly and easily identify the volume and style of flowers you require. Then all you have to do is start working out how you’re going to arrange them when they’re delivered. For creative couples who are happy to get their hands dirty and create their own floral arrangements, we highly recommend sourcing from a wholesaler to get the very best prices. Triangle Nursery supply to the trade, but will also sell directly to the public. With access to over 4000 flowers, foliage, accessories and floral supplies there is everything you could possibly hope for and prices are set according to current live auction prices. If you’re advance planning, you can send them a list of your preferred flowers and they’ll provide you with a quote that’s relevant to the time of year when you’ll be ordering. We like all the info and tools on their site that will help you identify what you’re going to need to order, as well as lots of advice on how to care for and arrange your blooms. There’s even a section where you can identify your style for the day from a selection of themes such as ‘rustic’, ‘gothic’ and ‘vintage’ and you can then see the suggested flowers that would suit. We hope we’ve given you lots of inspiration to create your own truly memorable wedding, but for more advice, why not give our knowledgeable wedding planners a call today. While you’re at it, you could arrange a private tour of our stunning country Manor house. Give us a call on 01394 411288 or email info@woodhallmanor.com to find out more about Woodhall Manor.